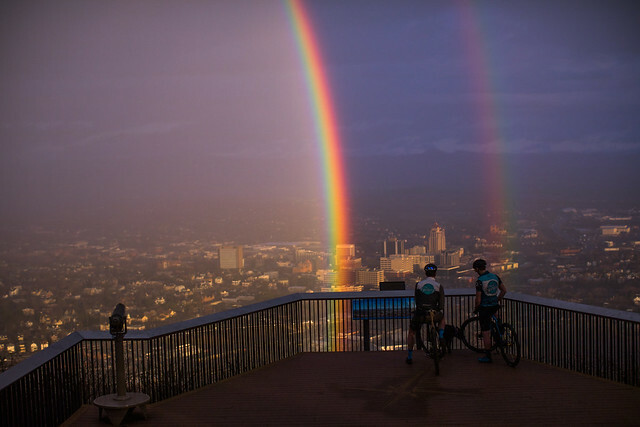 One of the best ways to experience Roanoke in Virginia’s Blue Ridge is by bicycle, and there happens to be a robust bike share program that enables you to navigate from various points of the city and beyond. 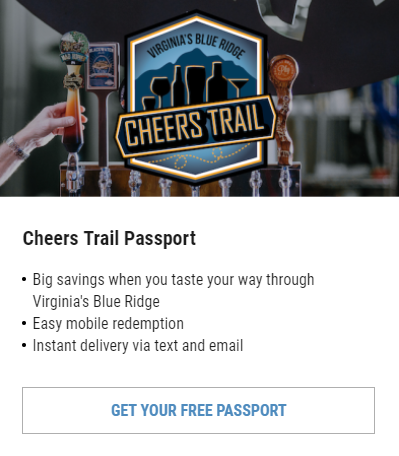 Zagster is an app-based bike share program managed by RIDE Solutions with 16 kiosks around Roanoke and one in Vinton. Download the app, create a profile, and find a kiosk near you to rent your bike. Your ride will cost you $3 per hour but not more than $24 for the day. A built-in locking cable enables you to “hold” your bike at a rack while you explore the sites, grab a bite to eat, or shop. “Shop? !” you might quizzically exclaim. Yes, shop. There’s a cute little basket on the front of each cruiser, and if it’s not carrying your toy poodle, it might as well carry to-go food or a sweet souvenir. Choose a theme for your next Zagster adventure with these suggestions. Ride on! Start your art tour at the West End Station on Salem Avenue SW. Your points of interest along the way are Virginia Design Collective and Downshift Bikes & Brews in the first leg. Those are just around the block on Campbell Avenue SW, and we love Downshift for a great cup of coffee in the morning and a seat on the rooftop patio. The Virginia Design Collective features an incredible collection of art and handmade goods from local artists. From there, it’s downhill for two minutes to Wilson Hughes Gallery and Aurora Studio Center. LinDor Arts is around the corner on 1st Street SW and then it’s on to see the large pieces of Art in Elmwood Park. Your final stop is Deschutes Brewery and the Downtown Market Station kiosk is right in front of the Hampton Inn on Church Avenue. Toast a beautiful art tour with an excellent craft beer. Note – The climb up Mill Mountain is a challenging ride. Unlock your cruiser at the Roanoke Memorial Station just off the Roanoke River Greenway. 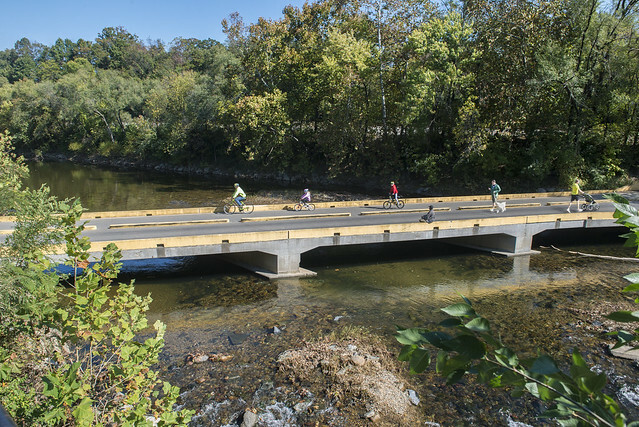 Hop on the Greenway and coast along the Roanoke River until you reach Piedmont Street SE. From there, turn left on Hamilton Terrace SE and a right on Walnut Avenue SE. Prepare for a nice, long climb up J.P. Fishburn Parkway and Mill Mountain to reach the Roanoke Star, the iconic neon beacon of Roanoke. After more than 800 feet of climbing, you’ll want to spend plenty of time soaking in the views before coasting back down Mill Mountain for a much deserved ice cream treat at Blue Cow. Don’t over-indulge though. There’s another treat waiting at Starr Hill Pilot Brewery, just a block from the Riverside Station bike kiosk where you’ll return your wheels. A mostly flat 2.5-mile ride along Campbell Avenue from the Downtown Big Lick Junction Station to the Vinton Farmers Market Station is a sweet 20 minutes of breeze in your hair. Before your ride, check out the Taubman Museum of Art, 11 galleries in one beautifully designed museum. From there, it’s on to Vinton and the farmers market where you’ll go ahead and turn in your bike before walking to Twin Creeks Brewing for a tasty craft beer, and dinner at the new FarmBurguesa restaurant. At the corner of 1st and Salem is MLK Station. Secure your ride and proceed across the Martin Luther King, Jr. Bridge to see the Martin Luther King, Jr. Statue. From there, destinations like The Hotel Roanoke, St. Andrew’s Church, and Historic Gainsboro Library offer beautiful architecture and opportunity to take a deep-dive into Roanoke’s history. Wrap up your ride at Soaring Ridge Craft Brewers, which is also where you’ll leave your bike at the Soaring Ridge Station. Take a stroll through a South Roanoke neighborhood – Crystal Spring – and make a few “local” stops for coffee and lunch. Pick up your bike at the Crystal Spring Station on the corner of Crystal Spring Avenue and 22nd Street. Pedal up Crystal Spring Avenue for six blocks to hang a right onto 28th Street, then a right on Avenham Avenue for a downhill coast among homes of various sizes and architecture, and mature trees. At the end of Avenham, follow Broadway to Sweet Donkey Coffee for a cold beverage of your choice. When you feel refreshed, hop back on to complete your loop, following McClanahan back to Crystal Spring Avenue to check in your bike and get a meal at Fork in the Alley. Beautiful, grand homes are the eye candy on the Old Southwest Loop. Check out a bike at Heritage Hall on the corner of Highland Avenue and 4th Street. Travel west to a left onto 5th Street and enter Highland Park on your right. Stop to see the Highland Park Fountain and then head up the hill to play a round of disc golf. When you’re ready to roll again, loop around the back side of the park to Walnut Avenue. It’s a peaceful shaded lane, and following Walnut around the park to a left onto 4th Street will deliver you to Wildflour Market & Bakery. Sandwiches, salads, and refreshing drinks are available to wind down your experience before traveling just two and one-half more blocks on 4th Street to the bike share kiosk. Your chariot awaits at Grandin Village Station in the heart of Grandin Village. Before you even choose your bike you can check out the vibe of Grandin by walking across the street to Urban Gypsy and New to Me. Hop aboard and pedal just a very short stretch before hopping in for a cold treat (encouragement, don’t you know!) at Pop’s Ice Cream around the corner on Memorial Avenue. When your sweet tooth is satisfied, get back on and make your way down Memorial Avenue to cross the river and explore Black Dog Salvage, one of our favorite places to find the perfect things we didn’t know we needed. From there, cycle into downtown by way of Campbell Avenue to 5th Street to Salem Avenue to arrive at Big Lick Brewing Co. & Tuco’s. Return your ride at Downtown West End Station right beside Big Lick. Start your laid back greenway tour when you unlock a bike at Piedmont Station at the end of Arbor Avenue alongside the Roanoke River. Ride southeast for about a mile and a half to Smith Park where you can enjoy some shade, refill a water bottle, or watch kayakers come and go on the river. Hop back onto the Roanoke River Greenway and hop off at The River House at the corner of Wasena Avenue & 8th Street. Tackle the indoor climbing wall at River Rock Climbing Gym before getting a cold drink or food at Wasena City Tap Room. 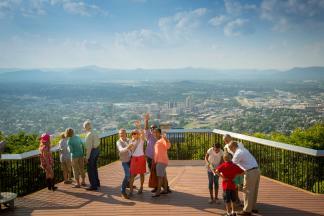 You can also get inspiration for more outdoor fun by checking out Roanoke Mountain Adventures. Your next stop is The Hive Tasting Room, where honey, mead, cider, and wine are available by flight, glass, or bottle. If that’s enough riding for you, check in your bike at the Wasena Station on the corner of Wasena Avenue and 8th Street, or simply go back from whence you came and check it in at Piedmont Station. Be careful with this bike tour, as it’s not safer to drink and bike than it is to drink and drive. “Same difference,” actually, so taste in moderation to be safe or simply check in your bike at one of the stations at the breweries and call a taxi. To begin, check out a bike at Soaring Ridge Station at Soaring Ridge Brewers on Shenandoah Avenue. You might choose to sample something here before rolling down 5th Street to a left on Salem Avenue to Big Lick Brewing, or you might choose to have your first taste at Big Lick. Whichever you choose, there’s a bike share kiosk at Big Lick called the Downtown West Station, and you can certainly check in your bike and call it a day. Perhaps you’ve been to Big Lick but want to try the beers at Deschutes. Sounds good! 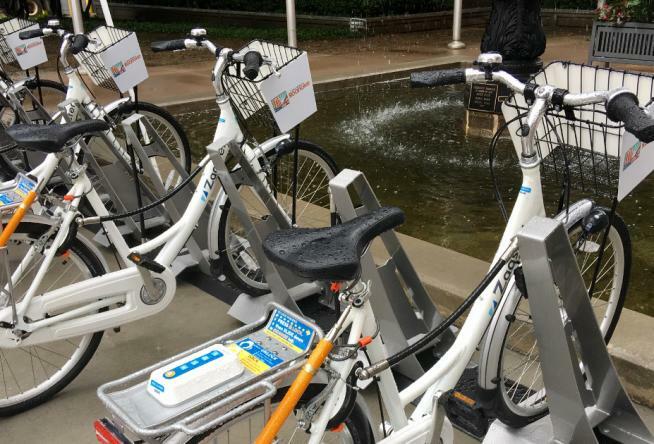 Keep pedaling down Salem Avenue and zig-zag along Jefferson to Campbell to Market Street to reach Deschutes Brewery Tasting Room, where there is also a kiosk if you’re ready to turn in your bike. If not, Starr Hill is another mile away. Continue through the alley by Hampton Inn and into Elmwood Park where you’ll hang a left on Jefferson Street. Watch for the Riverside Station kiosk to your right on the corner of Riverside Circle. Starr Hill Pilot Brewery will be directly across from you at The Bridges development between Starbucks and Moe&apos;s.
See downtown and one of our great neighborhoods when you take the route from Downtown Market Station to Crystal Spring Station. Right at the start you’ll want to spend time perusing Historic Roanoke City Market and Center in the Square, both down Market Street from the bike share kiosk in front of Hampton Inn & Suites on Church Avenue. Backtrack up Market Street to follow the alley into Elmwood Park where there is a public art walk. When you’re ready to leave Elmwood, roll onto Jefferson heading south to “hold” your bike at Riverside Station before tasting whatever is fresh on tap at Starr Hill Pilot Brewery. Then see what’s happening at Dr Pepper Park at The Bridges, a venue for great music and entertainment. Your final destination is Viva la Cupcake on Crystal Spring Avenue, less than a mile away. Check in your bike at the Crystal Spring Station on the corner of Crystal Spring Avenue and 22nd Street. Are you ready to explore the Star City on two wheels? We’re ready to have you! Learn more about cycling in Virginia’s Blue Ridge and check out the Zagster website for more information. This video from the Roanoke Regional Partnership is another great resource to help you get started.